Smartlink Network Systems —- Cash on Books 300-360 crores – Market Cap 130-140 crores- A good investment pick. Although i have been recommending the stock many a times on this site. We earlier initiated a buy around 68-73 before the dividend being announced. Booked out major quantity at 90 taking a cautious stance on announcement. For the past many months we have been advising clients to accumulate the stock between 44-38 with a medium to long term view. Lets look into a little brief about what did the company do. 1) The major portion ( 90% of revenues ) of the company was sold for 500 crores and announced a dividend of 30 rs + 2 rs of normal dividend. 2) The promoter did not take any non compete fee. One should definitely read this interview. 3) After the dissociation from D Link India the promoter had 62 %. 4) The company is getting back into the Active Networking business which it was doing for last 15 years with the brands DigiSol and Digicare. This can be in conflict with the original business of D Link which was demerged but there is no clause to not allow Smartlink to get into similar business. For the active networking business they would still be using the same set of Regional Distributors and goodwill for last 10-15 years. Now lets look at a few reasons to buy the stock. 1) The promoter had 62% share in the Smartlink entity post the demerger. This increased from January 2010 to September 2010 to 67.33%. Indian promoters are allowed only 5% increase in stakes in the stock through creeping acquisition. That is a clear positive. Most of this buying was done at a rough average of 50 rs ( Many of the acquisitions have also taken place at 60 + levels ). Promoter has not sold any share since then. 2) The promoter owned the Smartlink brand which he has sold for a consideration of Re 1 instead of taking non compete fees like many other companies have done in such slump sale. 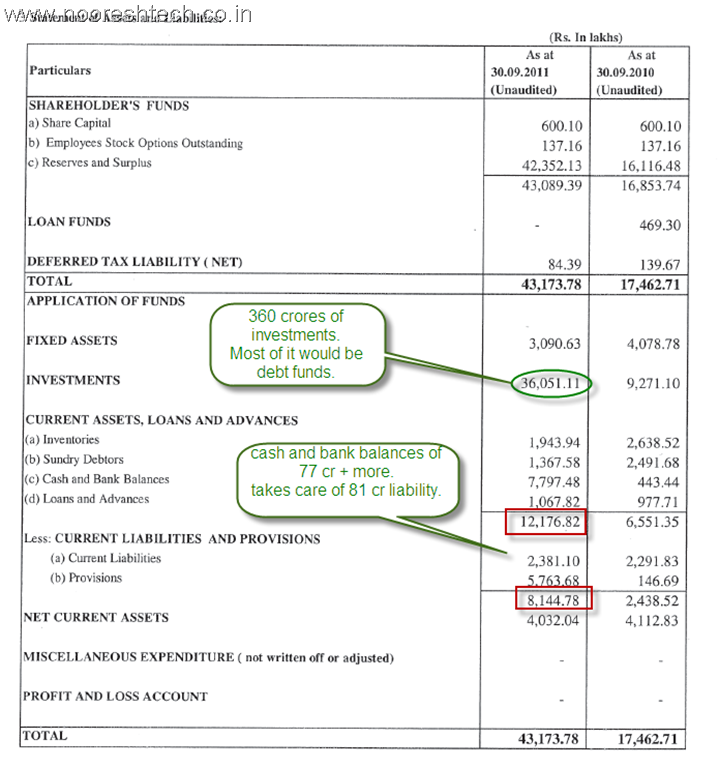 4) Now let us look at the current results and Statement of Assets and Liabilities sheet as submitted by the company in current quarter results. The company has around 360 cr in investments. The cash balances of 77-78 cr + loans. 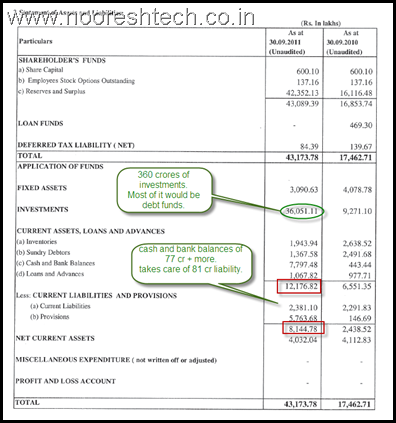 inventories etc take care of the 81 cr liability. 5) The company posted a loss of around 7 cr ( need to check here how much more would they keep losing in setting up the current business ). Assuming the losses would continue for some time to come but that may be taken care by the interest income. Also with such a huge cash reserve it may be able to turn the business profitable faster. So overall the company has 300-360 cr of cash and cash equivalents. Apart from that the company may have other fixed assets and relationships built over last many years. With roughly around 3 cr shares it gives a book value of 100-120. The current market price is 46. The current market cap of 140 crores gives a good amount of safety. 1) The control of the company remains with the promoter and he can utilize the cash as he wants. Will he do some stupid capex like Indo Asian Fuse gear or put their money into markets like Gwalior Chemicals or become a P-E fund like Piramal Healthcare ( I like this story at 360-320 will cover in further posts). 2) The company goes into a large capex in the business of Digisol/digicare or any other such business which will eat into the capital and one may need to be patient. 3) The company keeps doing stupid expenses to siphon of money without giving benefit to the shareholders. 1) Mr K R Naik said if he cant find a way to utilize the cash he will give it back to the shareholders. Can we expect another special dividend. 2) The company sticks to the dividend policy and gives 2 bucks next year. 3) The company is able to crack big in the field of active networking and starts making profits. Suddenly people will value the cash as well as the earnings. Any disclosure of the further plan if liked by the market will lift the stock quickly. At the current market cap of 130-140 crores against a cash of 300-360 crores the stock seems grossly undervalued. If one values the credibility and ability of the management ( which i very well do ) then all the benefits outweigh all the negatives. Also the company sticking to their field of expertise makes us increase the belief in the company. Till now the promoters have done everything by the book in terms of disclosures , dividends only thing missing is the future plans. All in all we believe the downside could be limited but on more clarity from the management the stock can easily move up 50-100% over the next 1-2 years ( can do more also ). Dislcosure: We have exposure in the stock as well as recommended to clients at 38-42 levels recently in our Investment Portfolio ( To Subscribe click here ) - There would be an obvious bias. Please do your own research as the above nos are a quick approximation. Result for this quarter is not good with loss of 0.55 cr. Why a bad result this quarter? – Smartlink, had started off manufacturing Active Network Devices and then formed a J.V to venture more into the Passive business. They have not been able to growth sales in that segment since then. If the founder was so bullish on the same segment, he could have alteast managed some level of growth in this segment. – The management sold off a cash cow and is tryin to justify its decision. A business which was growing at a decent rate and had enough scope and demand. – With higher peneteration of Internet Suscribers and more and more stress on network related devices , valuing the business at jus 5x times revenues is not justified. -When you say a 360crore Investment on the books, it is in a way idle money. Since the split of this business to Schneider, I doubt whether the company has come out with major investment plans or any other happenings to accelatarate active biz devices. – Also a Rs.350cr cash on the books would earn not more than 450cr at a CAGR of 7% 5 years, whereas a bullish entrepreneur could easily utilise this tech boom to first turn around the other business and then may be sell of the money making business at better valuations. -Risking 90% of Revenues for magnifying 10% revenues with major money sitting on the balance sheet indicates poor management, as it exposes the Co. and makes it a lot more vulnerable. – A 2buck dividend with the high promoter stake indicates whose filling the pockets regularly, going by the old school thought of growth companies looking for more and more capex in the intial years. Anyways, I had an contradicting view, so I thought would share it. Well i doubt anyone would give more then 5 times sales to any company. Also as a matter of fact i believe the promoters has mentioned indirectly that the earlier entity being 50% partnership many of the plans could not go ahead. So we need to see how the company works its way out over the next couple of years. Also at 1/3rd book i would prefer to bet on a company which may not grow 🙂 and book out profits at 30-50% jump and then see the way it goes. Will look into other points. Do let everyone know other companies you are tracking fundamentally which have good growth prospects. For fundamental pick Federal Moghul goetze and Vesuvius are the two stocks to pick, if possible you can look into the fundamentals & future prospects and u think is is adviceable can post it for the subscribers for good investment pick…. Federal need to check. Vesuivius is an excellent bet. Andhra bank, IOB, Corp. bank & IDBI. Having good investment in KOTAK MAHINDRA BANK but getting very low dividend compare to these. So, please advice for hold in kotak or partially switch to other cheap banking stock which have good future. I would prefer SBI in PSU Banks. For switching Kotak Bank remains a good one for long term. 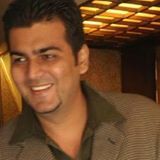 If possible pls let us know abt the Federal moghul goetze…..
as i seen in BSE SITE. Yes thats inclusive of interest income. Nice write up. I have been tracking this stock for last four months. The continuing business of the company ( active networks) has seen a three fold jump in turnover from Rs5+ cr in q1 2012 to Rs. 15+ crs in q2 2012. The turnover run rate is now over Rs 80+ cr. on an annualized basis. The operating margins have been negative because of huge personnel cost ( quarterly run rate of over Rs. 6 cr almost same as was the case before selling the passive network business. Ccomparable business like d-link has just over rs 3.5 cr personnel cost for three times revenue) because of a strategy of putting in people in place before brand gets traction. Time will only tell whether this will work but Q2 results are very encouraging. The mother board business looks like has taken off very well and the company’s sales promotion scheme is currently on for sales of over 100000 mother board this quarter. If the company is able to achieve this number one can see another significant jump in topline on q on q basis in this quarter. The total motherboard market in india is about 4 million this year and sales of this business are driven by is ex-ceo of Gigabyte india which is current number 1 player in the Indian market. Incidently Gigabyte India was set up by Mr Naik in 90’s and he was Chairman of that company for a long time before Gigabyte took 100% control of it . If the company achieved 100000 quarterly sales in q3, it will have roughly 10% marketshare in the indian market as per my crude estimate and i think it will be amongst the top 3 players. That would be a phenomenal achievement for a brand in less than 6 months of launch. So while currently smartlink is value play soon it could be a growth play. Thanks for the input. Even i was looking at the employee cost to be the same as before which implied Smartlink was working on something and was searching more on online data to see how the growth is picking up in the business. But this facet of growth makes the stock more interesting. Also did not know Mr K R Naik was a CEO of Gigabyte before. By the way any idea if company is planning to make products for intel in india or looking towards contract manufacturing for Tablet phones etc – there was one article on this. Thanks for the inputs and please keep updating this page with your comments. Investors in the stock may please read the comments by Rakesh and Atul. As both give a different angle to the stock. My impression is that Mr Naik wants to build his own brands and is focussed on that i.e building Digilite, Digisol and Digicare. I suspect between these three the addressable Indian market is more than one billion dollar growing at 15% a year. He is confident the brands can be built given that he started Dlink in India and build it to over Rs.200 cr+ company, then he started Gigabyte which is now no. 1 in India, then he started Digilink as a standalone brand and made it to no.3 in India before selling it last year. Incidently all the manufacture of Dlink and Gigabyte was done in Smartlinks factories in Goa. So chances are that he may do contract manufacturing but I do not think that will be focus. I am also excited by the potential of Digicare as a RMA operator . They already has Intel as client along with host of other brands. I think with a little bit of luck this could well become Jewel in the crown. Recently Smartlink announced that it was successfully able to sell more than 100000 motherboards by dec2011. If this turns out to be true the turnover this quarter has to well over Rs 30 cr+ more than double last quarter. More importantly this will make it the third biggest brand in India in less than one year. Also the promoter has added 3% more stake so now holding goes beyond 70% . I would also expect a good big dividend in the later part of the year. Please keep us posted on anything more you dig on the stock. What is your take on the company’s 4th quarter results? Topline has also fallen. Is this seasonal during year-end with companies completing tech purchases? Did you succeed in interacting with management? If so, your take? Well the topline has to fall as the major part of the business is gone. We need to see on a fresh basis. Overall the company will take time to establish a new venture and churn turn-over.